Even the most passionate fashionistas avoid some of the craziest trends of each season. 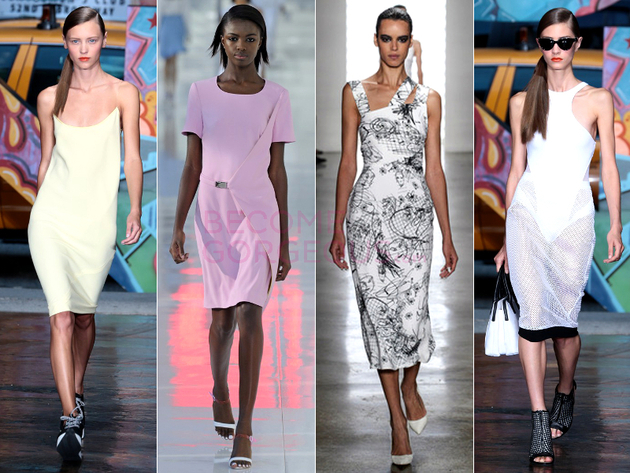 If you’re simply looking for the best wearable clothes that feel modern, check out the top 10 spring 2014 fashion trends. From fabrics and colors to perfectly tailored looks, here are the most stunning trends you should adopt as you put together your wardrobe for the new season. Spring is all about light fabrics and bright colors, so chiffon becoming a spring 2014 staple wasn’t much of a surprise for anyone who’s been following the latest trends. Add lightness to your looks with this airy fabric, featured in some of the best spring collections. The right way to wear chiffon this spring is to layer it under your tops, as proven by collections from Dior, Fendi, Oscar de la Renta and Céline. Usually, pastels are a spring must, but this year earthy tones are also getting in the top 10 spring 2014 fashion trends. While Prabal Gurung and Jason Wu heavily featured pastels in their spring/summer collection, many other designers have opted for more earthy tones. Neutrals, nudes, khakis and earthy tones have been prominently featured in the newest Michael Kors, Valentino and Donna Karan collections. After enjoying a long time in the spotlight in the 90s, sheath dresses are coming back in style. This chic piece has been revived by Stella McCartney, but many other designers have featured it n their S/S collections, including DKNY, Preen and Helmut Lang. Go for the slick version, that barely hangs on to your shoulders for a truly trendy look. Moto jackets on their way out, but they’re being replaced this season with cool bomber jackets. Prints are in when it comes to jackets and sporty details are another reason why bomber jackets are in the top 10 Spring 2014 fashion trends, perfectly represented in the newest Marc by Marc Jacobs collection. If you don’t like the bomber style, simply choose a cropped and boxy jacket, like the ones featured in Rebecca Minkoff and Barbara Bui collections. Replace your graphic tees with a shift blouse for a more sophisticated look this spring. Textures and prints add to the charm of the shift blouse, that features a flattering boxy silhouette and sleeves that almost reach your elbows. Get inspired by the Calvin Klein version for spring 2014. Get the flowy look perfect for spring with wide-leg pants, that can also be very flattering. The secret to wearing them is that they’re flattering for everyone, and that’s what places wide-leg trousers amongst the top 10 spring 2014 fashion trends. Opt for a high waist and less flare if you’re not very tall, but would still like to sport this trendy look, as seen on the runway in the BCBG Max Azria collection. The perfect spring coat for this season completely lacks a collar. Featured in Rachel Zoe and J. Crew collections, the newest coats are long and simple, a perfect statement piece in neutral colors. That doesn’t mean you should hold back if you’d like more color or a cute print. Tired of midi skirts but not ready to go for the summery maxi? Tea-length skirts are one of the top 10 Spring 2014 fashion trends and they meet the two in the middle. If you’re afraid this trend won’t be flattering, simply combine these unusual lenght skirts with cropped tops to elongate your frame. Proenza Schouler and Christian Siriano are some of the biggest advocates of this trend. Forget about the hippie vibe of fringe, because it’s one trend that’s turning luxe this season. If you’re not willing to risk it on skirts or pants, simply go for top with trendy fringe detailing, as showcased in the S/S Emilio Pucci, Miu Miu and Altuzarra collections. Most shades of lilac are making a big splash this spring, but it’s Pantone’s Radiant Orchid that deserves a place in the top 10 spring 2014 fashion trends. Used by everyone from Giorgio Armani to Zac Posen, this specific shade of lilac is the one to try this season.